Our January Bread Bible Bakers project is one that had me happy, yet annoyed at the same time. 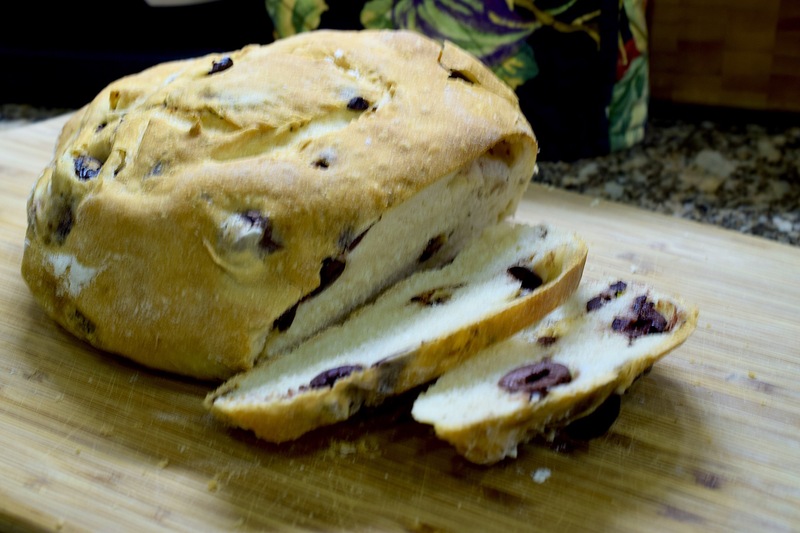 The olive bread recipe this month is one of my favorites, but I was annoyed by having to wait to slice into it until I managed to get a decent photograph of it. I was experimenting with a new camera lens and couldn’t get the focus right. I was impatient like the Cookie Monster in the Apple commercial last year and ended up taking some of the shots with my iPhone instead of my DSLR. ICYMI, you can watch the commercial here, I’m sure you’ll be able to relate LOL. I’ve been baking this recipe for years, and the only thing I do differently from the recipe has to do with the preparation of the olives. I’d say that nine times out of ten I use pitted kalamata olives that I usually have on hand in my refrigerator at all times. When I prepare the biga, I also take a moment to measure out my olives in a small bowl. I will usually add some sort of herbs or spices, for example, fresh rosemary or oregano. Depending on my mood, I may also add a pinch of crushed red pepper flakes, a bit of lemon zest, or perhaps a clove of garlic and a bit of olive oil. When I’m ready to chop the olives and add them to the dough, I make sure to add a bit of extra flour, perhaps double what Rose recommends to ensure the olives and added oil don’t make the dough soggy. For this version I used a Turkish pepper spice mix along with a clove of garlic which I had sliced. For those who don’t have the book, but are curious about the recipe, Rose published an article 20 years ago where she discusses a sourdough version which I believe was her original inspiration for this bread. Now that I’ve discovered the sourdough version, I can’t wait to try it. You can find that version ﻿here. This recipe is really simple to make, and I’m able to get consistently good results. I use my handy La Cloche baker which has been such a good investment for me over the years. For more about this clay baker click ﻿here﻿. When entertaining, I will double the recipe because this bread is so good that everybody will want more. A loaf of this bread isn’t that large and will go very quickly. 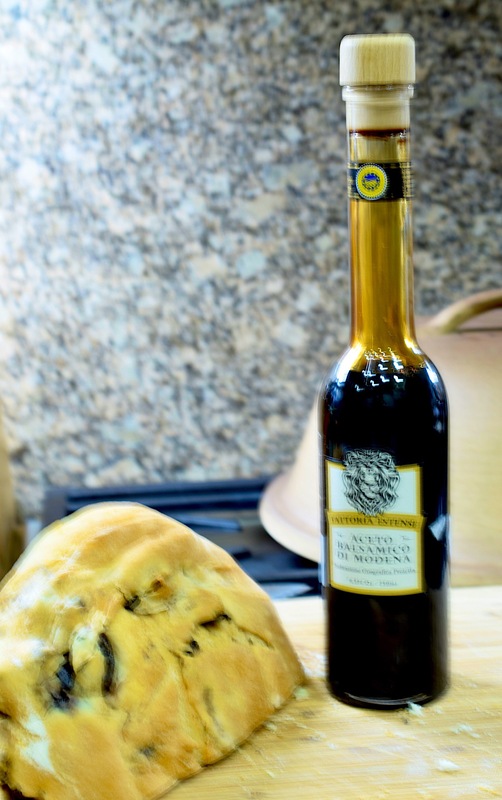 Serve this bread warm with some good olive oil and balsamic on the side. I splurged a few months ago and bought what to me was a hideously expensive bottle of 12-year old balsamic from Sur la Table. This stuff is absolutely heavenly and deserves your best olive oil to go with it. I also used some of this bread for a smoked turkey sandwich which was another delicious use of this bread. This entry was posted in Baking, Everything, Rose's Bread Bible Bakers and tagged bread baking, bread baking technique, bread recipes. Bookmark the permalink.